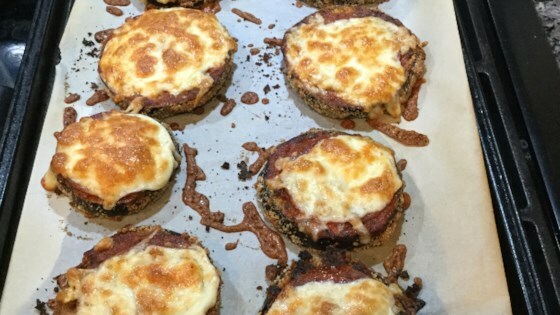 "Parmesan cheese, almond flour, and Italian seasonings coat these keto-friendly eggplant pizzas topped with pepperoni; add any other toppings you like." Place eggplant slices on a double layer of paper towels and sprinkle salt generously on both sides. Allow to stand at least 30 minutes to draw out moisture. Preheat the oven to 375 degrees F (190 degrees C). Line a large baking sheet with parchment paper and coat with oil. Mix almond flour, Parmesan cheese, Italian seasoning, garlic powder, and crushed red pepper together in a wide, flat container. Mix eggs and water together in a separate wide, flat container. Rinse eggplant slice to remove salt and pat dry. Dredge each slice thoroughly in egg wash, coat with breading, and place on the prepared baking sheet. Sprinkle with remaining breading if any eggplant is still exposed. Bake in the preheated oven until tops are slightly browned, 18 to 20 minutes. Rotate slices carefully and bake until nicely browned and tender, 5 to 8 minutes more. Spoon pizza sauce equally on top of baked eggplant slices, sprinkle with mozzarella cheese, and add pepperoni. Return baking sheet to the oven and bake until cheese is melted and eggplant is completely cooked through, 5 to 10 minutes more. Watch how to make real Italian baked eggplant with Parmesan. You can line the baking sheet with aluminum foil or a silicon mat if you prefer. To ensure both sides of the eggplant slices are properly breaded, place each egg-coated round into the container with the breading mixture and sprinkle the top with breading mixture. Flip the round and sprinkle the other side with breading. Then lift the eggplant round and shake off any excess coating. Optional: Place eggplant under the broiler during the last few minutes of cooking to get cheese and other toppings extra crispy and toasted.